TERRAM GrassProtecta grass reinforcement mesh heavy grade (14.5mm thick plastic mesh) with 150 steel fixing u-pins in the pack. 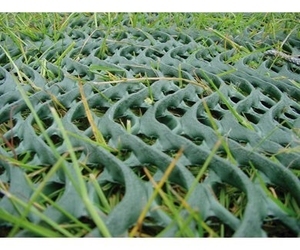 14.5mm thick heavy-duty plastic grass reinforcement mesh is used to protect grass used by cars, dogs, bikes and pedestrians. The mesh is laid onto the existing grass and secured in place using the steel u-pins supplied in the pack (Please note Ultimate One suggest purchasing additional U-pins to ensure rolls are adequately fixed. This heavy duty GrassProtecta will reinforce grass that is prone to wearing, rutting and become a muddy mess. Once installed leave the surface until the grass has grown through and roots have had a chance to interlock with the plastic mesh. 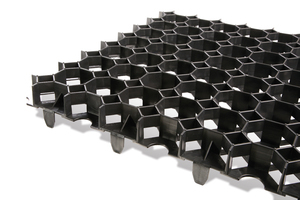 GRASSPROTECTA is MANUFACTURED in the UK by TERRAM, unlike other imported Chinese alternatives.